Browse Monochrome Factor Gallery: Recent | Popular. Hey thank you so much for this scan! he looks so good in this picture! Look verry nice.. 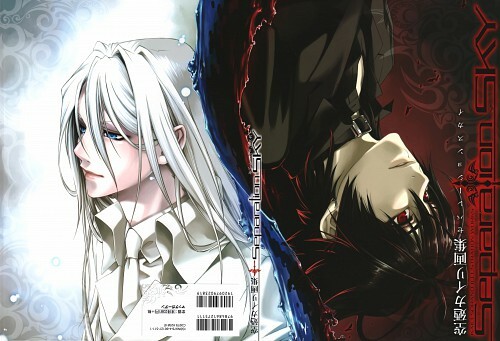 I almost buy this book for the cover... but i didnt know it belong to monochrome factor till now... too expensice then for me to buy just becos of the cover. love those red eyes.. very detailed feature and.. his hot! his skin is a bit pale though..
woah! cool scan! he looks so damn hot! thanks for this! i rlly like the art. it has an ability to capture a more realistic form rather than being too cartoony. reminds me of the way many shonen jump novels such as naruto, yu yu hakusho, and that basketball comic i cant remember the name- are drawn! the best anime. ready to watch again and again! This is a really cool scan - thanks for sharing! Wow!It's the most beautiful scan i ever seen! SORANO's style of drawing is always my fav!